Job description and job specification are two primary documents that are prepared in the job analysis process. They help to explain the essentials needs of a job and the qualifications that a job holder must hold for the performance of a particular task. Job description entails a full explanation of all the responsibilities and duties that a specific position entails. This may include designation, work conditions, nature of the task, relationship with other jobs, responsibilities, and qualifications required. To ensure that the right candidates apply for a specific task, the human resource manager must prepare a job description document before the organization advertises for the vacant position. Potential candidates are informed in advance what their duties and responsibilities will be before they are selected for the position under consideration. Job specification is a document that is used by the human resource management to highlight to potential job seekers of the requirements for the holder of a specific job position in the organization. Some of the vital information present in job specification tool include skills required, educational qualifications, professional experience, technical abilities, and personality. Job specification helps the human resource management or the recruiting body to have in mind the kind of an employee they are looking to incorporate into the organization. The job description is a document that is prepared by the management of the organization which states the specific duties and tasks that an employee is supposed to handle in the organization. The document outlines an overview of the responsibilities and functions of a specific task in a company. Job specification is a tool prepared by the human resource management or the recruiting body that highlights the ideal qualities of a specific job holder in an organization. A perfect job specification tool contains educational qualifications, experience, technical skills, and personality traits required to handle a specific job. A job description document is applied by the human resource management to provide sufficient information about a specific job in the organization. This information helps in evaluating job performance which is essential in determining training needs of an employee. The information present in the job specification document is applied by interested parties when analyzing whether they meet the specific needs of a particular job while at the same time helping the recruiting body to conceptualize the kind of an employee they want to hire. The benefits of a job description documents are that it helps in solving disputes in an organization where various employees are arguing about who should do what. This type of argument is prevalent where jobs are likely to overlap or very similar. The benefits of a job specification document are that it helps the management of the organization on making critical decisions that entail promotions, awarding bonuses to excellent employees, and transferring employees to the jobs that suit their personalities and technical capabilities. A job description statement contains specific information about what partakes a certain job in the organization. 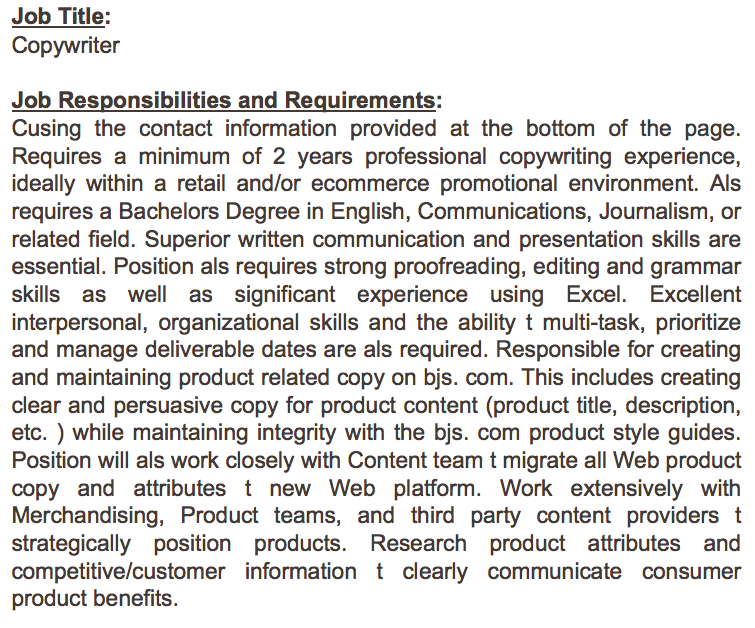 The contents include job title, job location, job summary, necessary materials, responsibilities, tools, machines, equipment, and relationship with other jobs in the same company. The contents of a job specification tool include educational qualifications, professional experience, training, technical skills, interpersonal relationships, mental capabilities, and emotional capabilities that are necessary for an individual to perform a certain task. The origin of a job description tool/document is a job analysis process which is an initiative that is focused on identifying and determining in details the particular job duties and requirements. Moreover, the job analysis highlights the relative importance of the responsibilities highlighted for a given task. Job specification tool originates from the job document. Before the human resource manager can determine the necessary skills and qualifications of a person to hold a specific job, he or she must fast determine what the job will entail regarding duties and responsibilities. Job description document is tailored towards measuring the tasks and the responsibilities that are attached to a specific job. This defines the boundaries of a job hence guiding where an office holder must observe. On the other hand, the job specification tool measures both physical and emotional capabilities that an office holder must possess to perform the job hence helping the interviewing panel to understand the person they want virtually. The job description is a document that highlights the contents of a specific job in an organization which includes duties and responsibilities while a job specification tool highlights the particular properties that a person must hold to perform a job. Job description document helps the human resource management to perform job evaluations which are necessary for determining the training needs of workers while job specification helps the human resource manager is promotions, transfers, and awarding bonuses. Job description document is used by the management of the organization in solving disputes within the organization, especially where tasks overlap while job specification document helps to apply parties to understand what is needed to secure employment in a particular organization. Some of the contents of job description include duties, responsibilities, relationship with other workers, job summary, and job location while materials of job specifications include qualification, experience, interpersonal skills, and emotional intelligence. Jecinta Morgan. 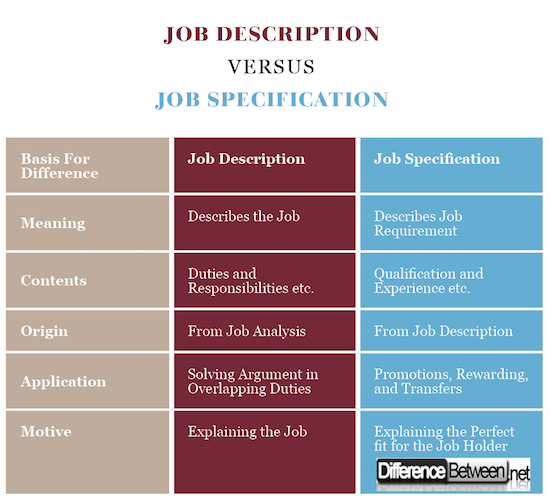 "Difference Between Job Description and Job Specification." DifferenceBetween.net. April 5, 2018 < http://www.differencebetween.net/miscellaneous/career-education/difference-between-job-description-and-job-specification/ >. Glasius, Marlies. "Human security from paradigm shift to operationalization: Job description for a human security worker." Security Dialogue 39.1 (2008): 31-54. Jackson, Warren B., and Sudhendu Rai. "System and method for converting print jobs stored in printshop job description language files into printshop workflow." U.S. Patent No. 7,064,848. 20 Jun. 2006. Viteles, Morris S. "Job Specifications and Diagnostic Tests of Job Competency Designed for the Auditing Division of a Street Railway Company: A Psychological Study in Industrial Guidance." The Psychological Clinic 14.3-4 (1922): 83.